Last week I decided I needed a little thrifting therapy so I visited a few thrift stores in search of some new/old treasures that I could take to the Coburg Antique Show. First up was a Goodwill where all I found was a cute tablecloth. Next I decided to stop by the Goodwill Outlet. You know, the stores with the big bins of junk, I mean excellent stuff. I had probably only been there a few minutes when I caught a woman's eye and she smiled at me and said, "I know you from your blog!" Her name was Paula (no blog :() and she couldn't have been sweeter. We chatted a bit then I continued to shop some more finding a few treasures here and there. Paula is also an antique dealer with a booth at the awesome Stars & Spendid Antique Mall. Turns out she recently met my good friend Mitzi, (finder of shopping carts) who also has a booth at Stars and Laurie. I told Paula that I'm so glad I took a shower that morning and she laughed. But seriously, now that I have a blog, I just never know when I'm going to be "blog spotted." ha ha BTW, Hi Paula, it was so nice meeting you. I hope to "bump" into you again sometime soon! Here are some pictures of my thrifted finds from that day. 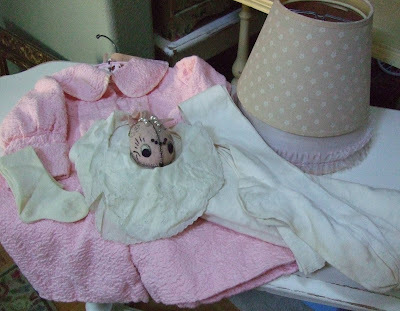 Pink baby coat (with sweet Made in France label), antique bibs, stockings, pink fish pin cushion. Muslin yardage and two vintage lamp shades. 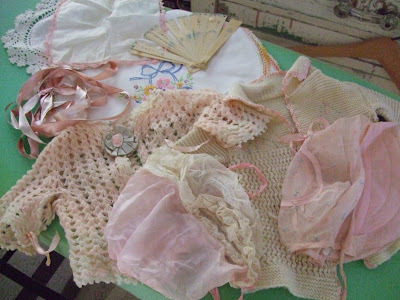 Two old baby sweaters, two pink baby bonnets, hand painted celluloid fan, misc. linens and ribbon. 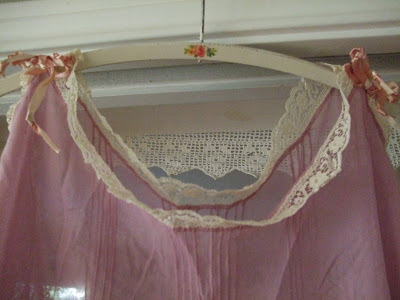 Beautiful victorian lavender night gown with pin tucks, lace and ribbon. So much prettier in person. On Friday I headed over to Monticello to pick up a few things. Made a few more thrifty stops along the way and found these items. Adorable powder blue vintage dresser, brass vase and trophy, tall cut glass jar, sugar bowl with hand painted roses (minus the lid), cool vintage tackle box, several bags of buttons, silver plate baby set and neat crusty plant stand (I'm keeping that for now). I also wanted to show you the after pictures of the items I showed on my last post. 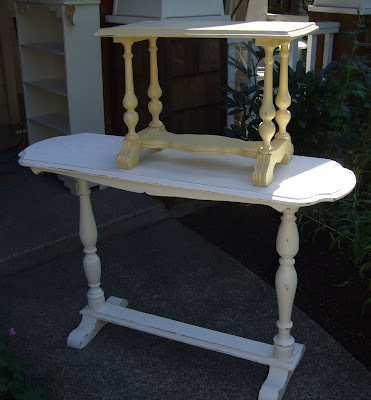 Here are the two little tables. Took both of them to Coburg. Only the little yellow one sold, but I think they both turned out pretty cute. Here is the mail cart that I finished about an hour before we left for Coburg. 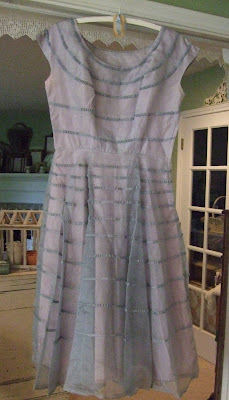 This much admired item sold to a sweet gal who lives in an old farmhouse with a laundry shute to the basement. She will use it to catch laundry. Very cool! One person thought it would be great in her daughter's room to hold her stuffed animals. Speaking of Coburg, Isabel and I had a great time and sold quite a bit. The weather was just perfect and it was so nice that we were able to set up the day before. It felt much more relaxed. On my next post I will share some pictures of some of my buddies booths and the few treasures I was lucky enough to purchase. Today Isabel and I took the stuff that wasn't sold at Coburg to Monticello to start getting set up for the Fall Premier Shopper Show starting on Friday. We are going back on Wednesday to finish up by putting out our smalls and giving our space lots of cute. I'll make sure to take pictures when we're done, but if you are in the area, the sale is going on all weekend and our booth will be set up for a whole month. I promised I would do the seven things tag and awards on this post, but they will have to wait a bit longer. I'm still trying to come up with 7 things you don't already know about me. I have a few, but need some more. I hope you are having a great Monday and I promise to be back soon! Hey; not bad shopping for one day. I wish I had that kind of luck when I went. I love the shopping carts and the mail cart. they are so pretty and shabby chic. Have a great week. I love the stuff you found while you were out thrift store shopping. I used to love the Goodwill Outlet, but recently I haven't found anything. That mail cart came out really cute. I hope one day to be able to do antique shows like you do. Right now I am just trying to start listing some items on etsy. Once again you found the good stuff. Great to see you at Coburg this weekend and for my surprise gift of wrapping paper! Totally made my day. I plan on hopping by Monticello on Friday....good luck setting up! That little cart is adorable, sweet chickee!!! Is it made from a quilt? Is it made from a quilt? Kinda looks like it. Great job! I've never seen another one like it. 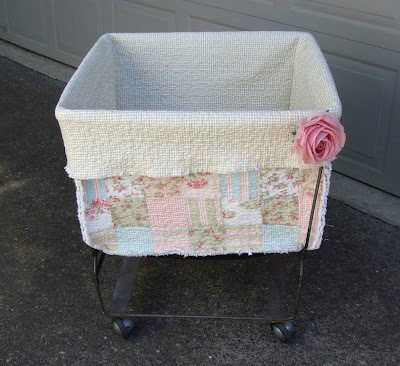 Lisa, I LOVE LOVE LOVE what you did with the mail cart! It's so adorable. I would have snatched it up too for my laundry area or office or somewhere! I would have found a spot for it. Love it! Everything looked so nice. I'm so glad you did well at Coburg. As always it's good to see you! I love that little pincushion. Did you sell it? WOW Am I glad that I found your blog!! It is wonderful! You are my kind of woman! Hey Lisa! We were planning on going to Coburg, but really just needed some down time at home. As far as the recipes, if we gave them to you then we would have to lock you in our basement to keep you isolated from the rest of the world!! LOL To be honest, the Chili was a miracle...I just kind of made it up as I went along (it was after midnight, I was exhausted and had to play it by ear). I did smoke some meat (beef and pork) and used a bunch of different kinds of beans, chili powder, kosher salt, black pepper, cayenne pepper, onions, peppers (jalepenos, sorenos, green, yellow and red). The cobbler Joe makes from memory, so you will have to come over and watch him work his magic...he doesn't measure anything either. Now you know the real reason we didn't post the recipes. :o) Hope to see you soon! Oh my gosh! What great finds. 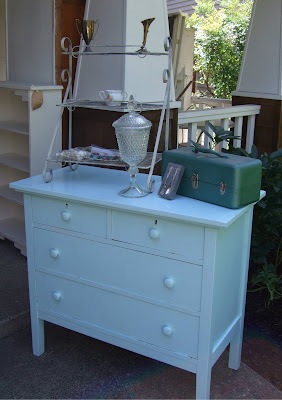 I need to come junkin with you! I never find that good of stuff here. I so wanted to go to Coburg. I'm planning on coming down in October sometime. I HAVE TO GO TO PORTLAND OR I'M GOING TO DIE! How is that for drama? I have been practicing it in front of the mirror for my academy award winning performance that I'm going to give The Hubs. Oh what pretty things you have! Wish I were closer so I could go to some of these sales, there are never any around here! I so love your blog. I sit down with a cup of coffee every morning and follow you and a few others on this wonderful junking adventure. Keep up the good work and for giving us out in blog land a bit of excitement, warm fuzzies and the desire to see and hear more.